Sharifa stands 6.5 feet tall, has black skin with golden coloured down fur around her chest and in stripes in places and a mane of gold around her neck. Two foot long antenna stick out from the top of her head, and two insect wings stick out from her back allowing her to fly gracefully and fast. Most distinctive is her four arms, long and slender and ending in clawed fingers, Sharifa also has hidden stingers in her arms she uses as a last resort. She fights with speed and grace with daggers and a buckler and a bow which she can fire from the air. Sharifa is, in fact, sister to the current Wasp Queen herself. However, the only person who knows this aside from Sharifa and the Queen is Angela, otherwise it is not a publicly known fact. This spiny succulent is used in medicine for its soothing properties. The flesh of its leaves has a gel like consistency and is a common ingredient for sweetened summer drinks. Small blades crafted in the shape of stars. Used by throwing at an opponent. This dagger-like weapon has a special handle that allows the blade to rest on the wielder's knuckles. While it can be used as a slashing weapon, a katar is most deadly when is is thrust at an opponent. An amulet than can charm and double as a small dagger; a favorite tool of assassins who want to blend in with a crowd, rather than to stalk their target from the shadows. Award for Dalanesca & Xunatar's 2018 God Event Malicious Vices! Several bolts of lightning shoot down from the sky to strike one or more targets. Armor made from a large insects hide and natural armor, form fitted for the wearer. Less protective than steel but it is lighter and easier to work with. 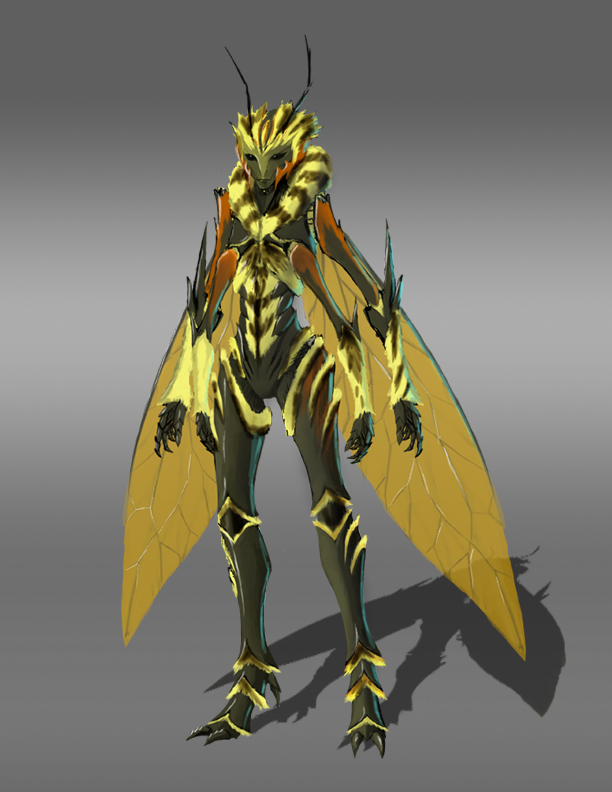 Spikes can be found on the arms sometimes, the nature of the chitin makes it easy to make to the wearers preferences. This is an event prize for Staff's 2018 Anniversary event Negation Order: Exterminate the Moons. Crafted from hard beetle horns, these tonfas are well balanced and ready to fight. When cast a swarm of buzzing insects appear to harasses, sting and bite the target of the spell. Spell's range is line of site, duration is around a minute unless acted upon by an outside force. Insects summoned vary with each casting of the spell. A finely crafted rapier created from a Wasp's stinger. Very strong in its durability thanks to some added magic, the rapier never needs to be sharpened and it will actually repair itself if broken, though it takes some time to do so. Originally invented by rogue Hiafae tailors, these outfits will change the temperature of the closest water to whatever the wearer desires. You can go diving around Itjivut without feeling cold in these! A primary source of aluminum, smiths use it often in their craft. A thick patch of moss taken from the lakes region. Sticky and tasty honeycomb fresh from a beehive. Mix into a potion for taste, or eat on its own. A medicinal wildflower native to many climates. A silver-green plant used for medicinal purposes and flavoring alcoholic spirits. A lightweight silver shield accented in black tourmaline. Will absorb any magickal attack when used, and reflect out a short burst of near blinding light magick to give the shielder time to prepare their own returning attack (or flee!). This sedimentary rock is made from the fossilized remains of tiny aquatic creatures. These lanterns are released every year at this time to represent the lives lost and the strive for peace and tranquility. A hope for a better tomorrow. So many paper faces on parade. Only some are truly the deities though. Can you guess which ones are who? A pinch of powdered reagents brimming with magical energies used by practitioners of the arcane. Enchanters use this as a base to imbue artifacts with magical properties. A curious cat that when happy is light and fluffy and white but when unhappy is gruesome, mean, and black. An aquatic creature that loves fish, though they are often hunted for their soft pelts. Fossilized resin from an enchanted tree. Residual magic has given it a bluish hue. Spines from the infamous ‘king of fruit’. Why did nature think this was a good idea?